September 2009: I took this photo with Joel’s automatic camera: view from the highway turn-out, The Kneeling Nun Mountain at Chino (Chinaman) Mine, southern New Mexico. A sight both amazing and devastating. One of the world’s largest copper mines. The scratches across the image are power lines in the foreground, recalling to mind marks in a copper intaglio printing plate. The date in florescent orange numbers becomes part of the recorded image; we have gotten used to seeing these elements as integral to our visual experience. The image I wove, finished in the Spring of 2016. 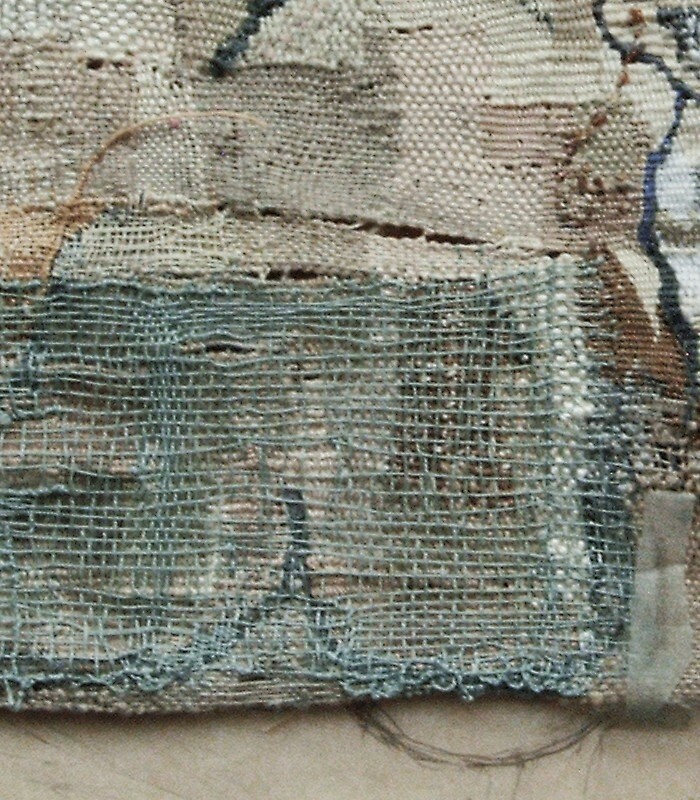 This is about the right hand piece of a self-portrait, a tapestry undertaken in response to lively discourse about Selfies on the American Tapestry Alliance member’s list, ATA-talk, back in January 2014. It is my 2nd Selfie/self portrait tapestry. About 40″ wide, the design is developing downward as a strip-weaving, which will ultimately include 5 or 6, 8″— 12″ high joined horizontal strips, plus this shaped hand. My working title is “Fracked Selfie: Penelope Unravels”. The idea evolves from an intersection of concerns: my own physiognomy in middle-age; the rage and current of deep-shale fracking that quakes the earth under my town, and weaving, which is a metaphor for both, through its surface sensitivity (like skin) and its structures, which are inherently responsive to our assumptions about the stability of matrixes. This is a chest-shot, a detail of the 2nd strip from the top, with drawing. 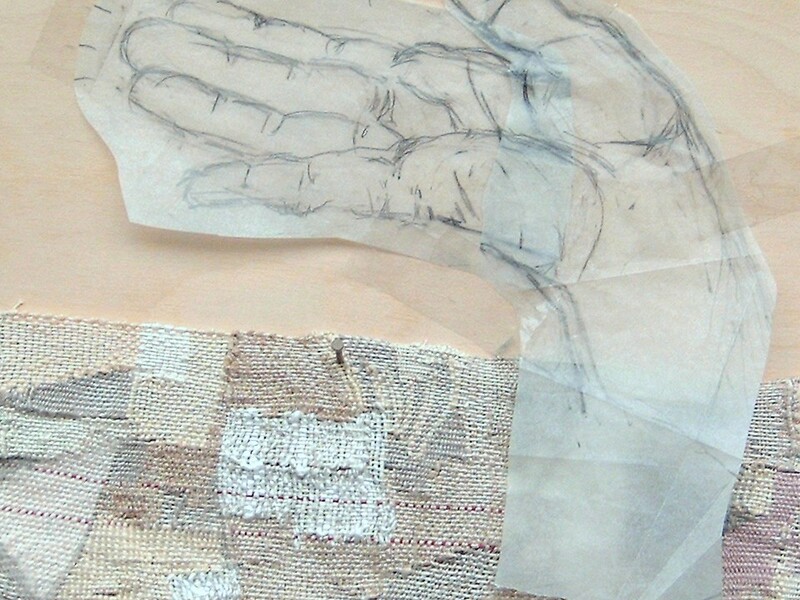 • I drew my right hand with my right hand, and seeing it taped onto my weaving, I thought I’d try weaving a hand on a shaped cardboard loom—like overlaying thin cut-out copper plates on my larger ‘key’, or matrix intaglio plates in printmaking. Near completion, the “woven loom” actually looks like a collograph print plate. I find I like working around the edges of this firm, but pliant shape, honing the warps that loop around its 1/8″ tabs into a binding, working many thread weights against the contours articulating bones, tendons, muscle pads—the tender resilience of my materials. mimicking the body part itself. The larger image above is close to true color. See http://selfiesonslow.wordpress.com —artists’ galleries/ margaret sunday— for updated photos of this tapestry in progress.